Global positioning system (GPS) bracelets are not as popular as mobile phones. At least not yet. 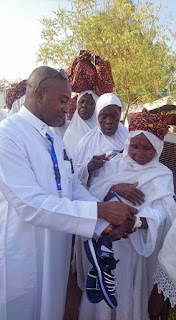 But some senior Sierra Leonean pilgrims in Mecca are already rolling with the high tech fashion. According to the Sierra Leone embassy in Saudi Arabia, small-town pilgrims from the west African country gave an A+ to the new smart wristbands. Haja Finda Bintu Kamanda, 65, from Tankoro in Sierra Leone's eastern diamond-rich Kono district, and Alhaji Ibrahim Conteh, 73, from Poturu in Pujehun, about 200 miles from the capital Freetown, had nothing but praise for the wearable technology. Speaking to the press officer at one of the holy sites in Mecca, the pilgrims thought the tracking and monitoring system was a brilliant idea, particularly for those who cannot read and write. “This is the first time some of us move (d) from our provincial towns to our capital, Freetown. But since we came we have never lost our way,” they said. According to the Saudi Press Agency, the bracelets are connected to GPS, based on a satellite system. Data is collected in real time. The bracelets contain personal and medical information to help authorities identify people, authorities said. The ID tags also have passport numbers, addresses, and information on the timings of prayers, which connects directly with apps on phones. Saudi Arabia announced in June that the kingdom planned to issue new wearable technology to all pilgrims travelling to Mecca for the world’s largest Islamic gathering. The decision came after a stampede in 2015 in which more than 750 people are believed to have died, with 900 injured. The annual pilgrimage to Mecca is attended by more than two million Muslims from around the world and has long been something of a safety nightmare.